In an effort to lower the barrier to entry in the fishing industry, to retire a “graying fleet” of vessels, and to attract a younger group of fishers into the industry, the Local Fish Fund has announced a new and innovative loan program. Loans are structured based on quotas and shares rather than fixed payments, which creates a system that is flexible and spreads risk. 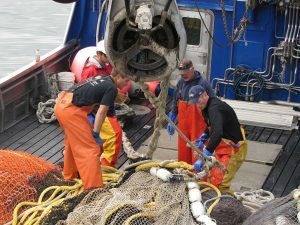 A recent survey reported that the average age of an Alaska fisherman is 50. Fewer young people are entering the field due to financial barriers such as a limited number of permits available as well as high vessel and equipment costs. Participants in the new Local Fish Fund loan program must be willing to participate in fishery conservation programs and agree to a variable repayment structure based on the value of their catch. As young fishers work to repay these loans, they build equity as well as credit history, making future loans and refinancing with traditional lenders an option. The “quota shares” will act as collateral for the borrower. Hand injuries can be devastating and sometimes career-ending for people who work at sea. Medical attention must be secured quickly after an injury for the best outcome. On Sunday, March 3rd, the U.S. Coast Guard medevaced a 57-year-old male after he sustained a hand injury while working aboard the F/V OCEAN ROVER. 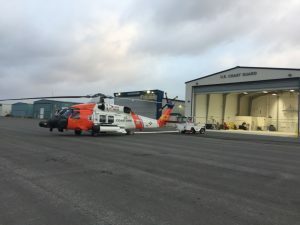 Watchstanders at Coast Guard 17th District Command Center in Juneau, Alaska received a call from Health Force Partners that a crewmember had suffered an injury and required medical attention. The Coast Guard Duty flight surgeon recommended a medevac, and an MH-65 Dolphin helicopter crew aboard the Cutter John Midgett hoisted the man from the F/V OCEAN ROVER. He was flown to Cold Bay then taken to Alaska Regional Hospital in Anchorage for treatment. A forward-deployed U.S. Coast Guard Air Station helicopter crew was called to medevac a crewmember on Monday after he suffered a compound fracture while aboard the F/V KARI MARIE. The fishing boat was located approximately 200 miles north of St. Paul, Alaska when the incident occurred. Watchstanders at District 17 Command Center received notification from the F/V PACIFIC MARINER about the injury, as they were relaying communications on behalf of the F/V KARI MARIE crew. In an effort to provide additional communication coverage, an Air Station Kodiak HC-130 Hercules aircrew was also diverted to assist with the incident. The crewmember was reported to be in stable condition after he was transported to local emergency medical personnel in St. Paul. 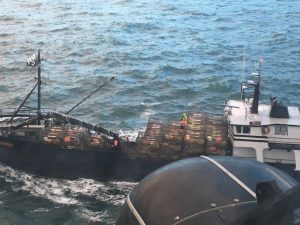 Five crewmembers were rescued on Friday by the Good Samaritan vessel KONA KAI after the F/V PACIFIC 1 sunk in the Bering Sea. Just before the Seattle based cod fishing boat went down, it was reported to have been listing heavily. 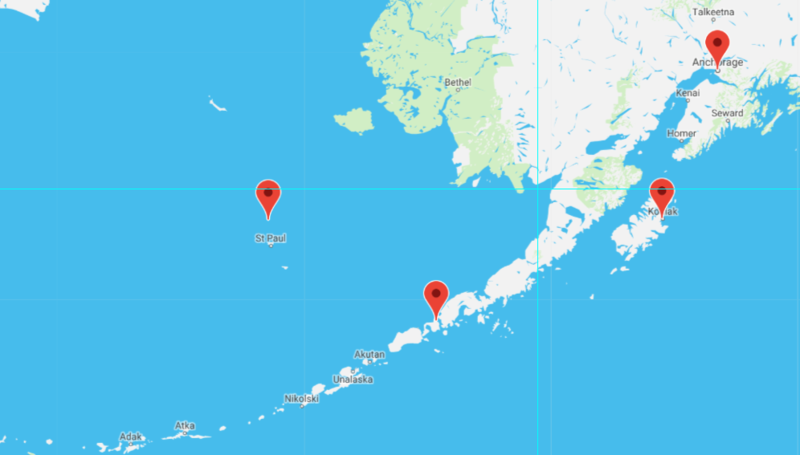 The U.S. Coast Guard watchstanders received notification from the F/V KONA KAI that the 58-foot F/V PACIFIC 1, located about 40 miles southwest of Dutch Harbor, Alaska, had begun taking on water. The KONA KAI lost communication with the Pacific 1, but their last known location was transmitted to officials. Two Coast Guard Air Station Kodiak MH-60 Jayhawk helicopter crews were deployed from their forward-operating location in Cold Bay, Alaska. They arrived in time to assist the KONA KAI in locating the inflatable life raft that held all 5 people. While Coast Guard personnel were able to locate the raft, an inflight issue forced them to set a data marker buoy then return to Cold Bay. 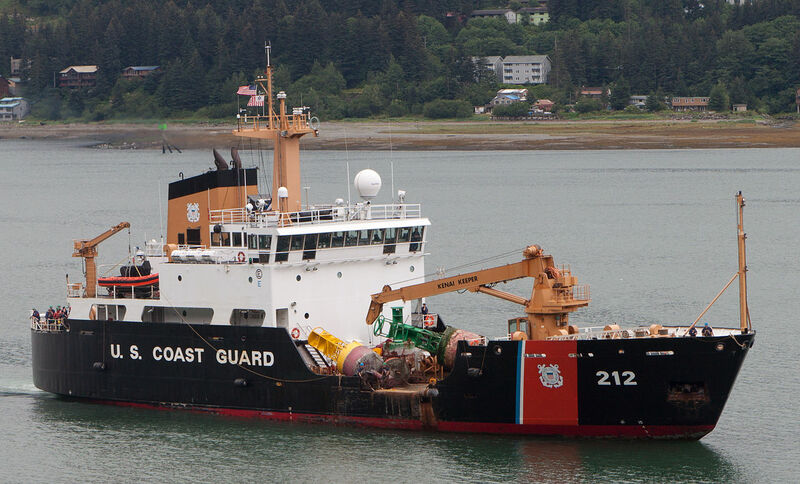 It is with great sadness that we report the death of a U.S. Coast Guard officer after he was struck by a crane in Homer, Alaska. 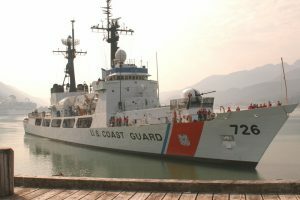 Michael Kozloski, a 35-year-old Chief Warrant Officer from Mahopac, New York, was a crew member aboard the Coast Guard Cutter Hickory. A 17-year veteran, he was working in the vessel buoy yard when a crane rolled over and struck him. Emergency medical personnel from the Homer Volunteer Fire Department responded and performed CPR. Officer Kozloski was transported to South Peninsula Hospital, where he was pronounced deceased. The U.S. Coast Guard “forward deploys” assets to Cold Bay during the winter fishing season in an effort to shave hours off flight times when emergency personnel must respond to situations in the Bering Sea and the Aleutian Islands. Once again, this practice proves prudent. On Tuesday, January 29th at approximately 11pm, the U.S. Coast Guard 17th District Command Center watchstanders received a call from Health Force Partners with a request for a medevac. A 35-year-old crewmember aboard the F/V Golden Alaska was suffering from severe leg pain and needed medical attention. The vessel was located approximately 40 miles north of the Cold Bay station. Watchstanders directed the launch of a U.S. Coast Guard Air Station Kodiak MH-60 Jayhawk helicopter aircrew, forward-deployed to Cold Bay. The crewmember was hoisted then transported to the Cold Bay clinic. It was reported that he arrived in stable condition. 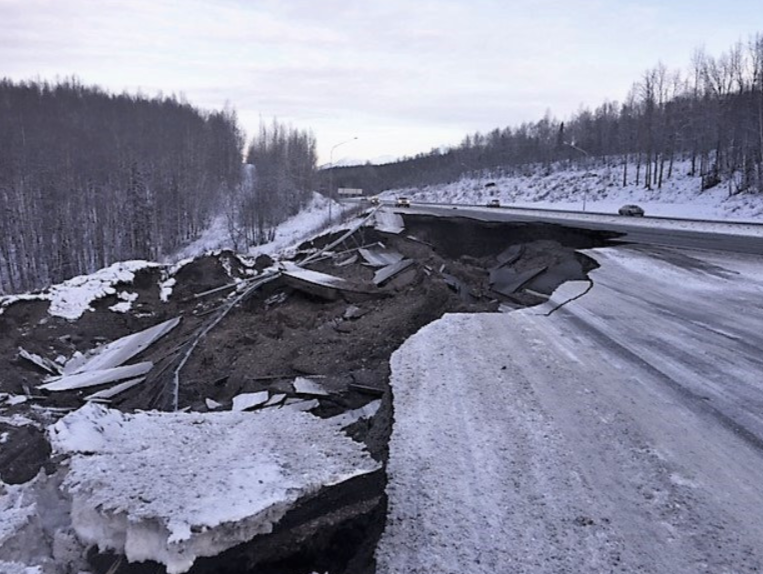 The massive earthquake that rocked Anchorage, Alaska, on Friday, November 30th caused widespread damage to roads, buildings, schools, and homes. Initially, a tsunami warning was issued after the quake, but it was revised and canceled after authorities assessed that there would be no giant wave. The earth began shaking at approximately 8:29 a.m. about eight miles outside of Anchorage. The jolting quake lasted for about one minute and registered 7.0. Many residents reported that they heard the rumbling sound of the quake just before the shaking began. And everyone agreed, it could have been so much worse. A 56-year-old fisherman is missing after falling overboard on Friday, October 26th. The F/V JUDA LEE was approximately 7 miles off the coast of Nome, Alaska when the incident occurred. Anthony Shelp, the vessel owner, was reportedly fishing with family members when he fell into the water. Crewmembers tried to pull him back aboard the vessel, but their efforts were unsuccessful. 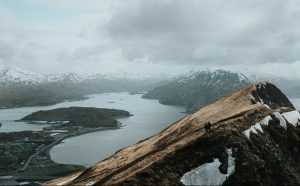 Alaska State Troopers were alerted, and the U.S. Coast Guard was called for assistance at approximately 10:45 a.m.
An Air Station Kodiak MH-60 Jayhawk helicopter crew was launched out of Kotzebue to search for Mr. Shelp. An urgent marine broadcast was also issued to alert all mariners in the area. Salmon season is always an anxious time for fisherman, as everyone waits to see how accurate catch predictions will be. But this year has proven to be quite disappointing as Alaska’s statewide salmon catch is expected to fall 31 percent below pre-season predictions. All species of salmon catches are down except for sockeye. According to the Alaska Department of Fish and Game, the total shortfall can be blamed on the poor returns of one specific species, pink salmon, to the Gulf of Alaska. Initial forecasting predicted a pink salmon catch of approximately 70 million, but current numbers are at 38 million. This small salmon species, also known as “Humpback Salmon” for the distinctive large hump that males develop on their backs during spawning season, usually weigh just 2 to 6 pounds as adults. Since the fish are flakey and low in oil content, they are generally processed and sold as value-added products such as salmon patties or frozen marinated steaks. Most pink salmon is canned, which yields a final product with a long shelf life that can be easily transported. It was expected that the pink salmon run would be low this year, as the fish returning are the offspring of those that spawned in 2016, a devastatingly low year for pink salmon. Alaska issued a federal disaster declaration in several regions due to the low 2016 harvest and was subsequently issued $56 million in aid. However, these 2018 yields are far lower than anyone predicted.